For many of us, Christmas is a sentimental time. During the holiday season, there is much preparation for gatherings of friends and family. Anticipation is the most intoxicating part and children whet their appetites for the coming of St. Nicholas by watching the numerous animated specials produced over the years. 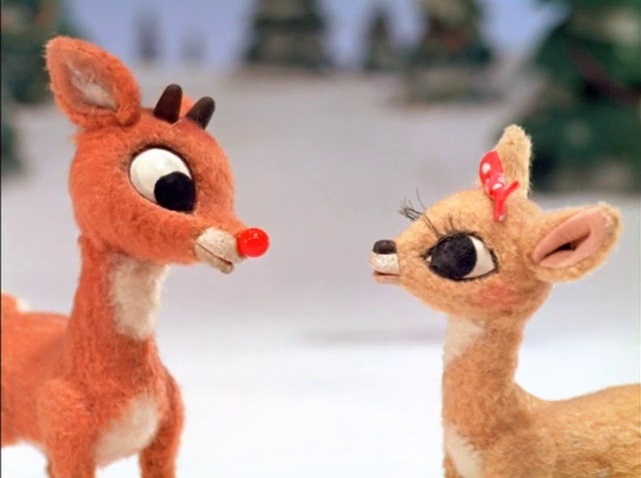 Particularly successful was a Rankin-Bass production called Rudolph the Red-Nosed Reindeer (1964), based roughly on a song by the same name. A strange thing occurred to me while reviewing these classics this year. First of all, as a grown-up I could appreciate what it was that made these special so appealing (or overrated) and secondly, I took a closer look at the role of Clarice, Rudolph’s girlfriend. Strictly speaking, she is a reindeer, not a little girl; but it is clear that the intent was that all characters, man or beast, were really stand-ins for human roles. Using an animal stand-in not only makes the character more appealing to children, but they can sometimes be endowed with some superhuman feature associated with that species (loyalty of dogs, courage of horses, wisdom of owls, etc.) I got to thinking how the role of Clarice informed my idea of the ideal little girl/girlfriend in my youth and how hard it is to shake this idealism when dealing with real women in the real world. Wouldn’t it be nice if every misfit in the world had an unconditionally compassionate companion to encourage him/her while facing the harsh challenges of the world? This entry was posted in CG & Animation, Film, Video & TV, Marks, Johnny, May, Robert, Muller, Romeo, Narrative, Roemer, Larry and tagged Christmas by Ron. Bookmark the permalink. Happy Christmas and New Year! I have not seen this particular film so cannot comment on the role Clarice plays but agree that children are susceptible to models of behaviour – or, at least, I was. I was possibly most influenced by Pinocchio mainly because the character’s world is harsh but the relationships between Pinocchio, Gepetto, Jiminy Cricket and the Blue Fairy, were, thanks to Disney’s visualisation, impressive to the mind of a 5-year-old. In answer to your question, yes, I think I would have benefited from an unconditionally compassionate companion. There are so many times in one’s life when one is faced with some quandary which would be simplified were we able to argue the toss with someone who cares for us no matter what decision we make. I guess this is the essence of all redemptive drama and possibly explains its enduring and powerful appeal.